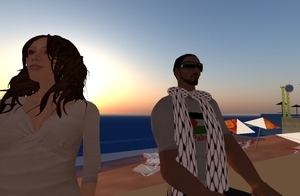 In Second Life there is a new Israel, appropriately called SL Israel, which recreates in virtual form aspects of the country, from religious landmarks of Jerusalem such as the Temple Mount, to tourist sites of Tel Aviv. Last week when Israel began launching guided missiles at Hamas targets in Palestine, however, SL Israel became a flashpoint of another kind. As the airstrikes pounded Gaza, so did protesters, teleporting into SL Israel, waving flags. “Lots of people yelling,” Beth Odets tells me. “They were going on and on with slurring obscenities about murderous Israeli forces, etc.” She gives me a screenshot taken during the incursion, festooned with anti-war or pro-Palestinian signs, some depicting dead Arab children. The protesters keep arriving, however. 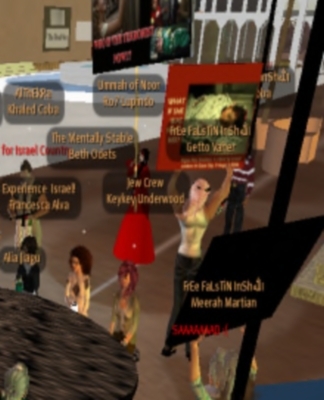 On a brief visit to SL Israel late last night, for example, I found a half-dozen members of something called “Second Life International Socialists”, brandishing placards and chattering in front of a lone avatar wearing a yarmaluke. In SL Israel, this was not the full extent of the reaction to the ongoing war in Gaza, however. “Later came people who were wanting to really talk,” Beth adds, “like the ones here.” She teleports me over, so I can see for myself. 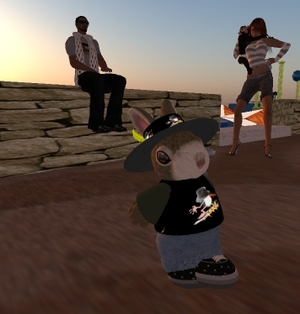 Which is how I found myself on the shoreline of SL Israel, amid an impromptu colloquium between a pro-Palestinian Muslim in a kaffiyeh, and avatar dressed as an IDF soldier, three Jewish women, and, of course, a talking rabbit. Along with the Arab headscarf, Clip Chau wears a “Free Palestine” T-Shirt, and when I arrive, he is talking on the boardwalk with a brunette named TamaraEden Zinnemann. I mostly listen from the sidelines, but TamaraEden Zinnemann looks up. I tell her that I will. Someone small at our feet pipes up. “Write that I’m a bunny, OK?” Shmoo Snook demands. I assent to that as well. “And cute, too!” he adds. That duly noted, the bunny proceeds to talk about the photos he saw of IDF rescuing Palestinians from a collapsed tunnel, and complain about the Bush Adminstration.